A large Swiss pension fund was looking to conduct a sustainability check of its portfolio. Its investment committee also wanted to learn about opportunities to improve the portfolio’s sustainability footprint. For the requisite know-how, the committee turned to Credit Suisse. Pension funds today are faced with a lot of challenges. In a low-interest rate environment they are increasingly having trouble generating the returns they need to meet their obligations. As is the case with many pension funds, the investment committee of this Swiss fund saw an opportunity to address some of its challenges by applying sustainable investment techniques in its portfolio. The committee saw value in the way sustainable investing could mitigate both investment and reputational risk in the portfolio by reducing its exposure to controversial businesses. Sustainable investing has also been shown to be an effective investment technique in its own right as it comes with no compromise on the performance and volatility side plus generates a social and environmental impact. As leading experts in the field of sustainable investing, Credit Suisse has long been at the forefront of this important industry development. We have seen a growing interest in it among a wide variety of clients, not just pension funds. These include private clients who want to make an impact while earning a return, families interested in aligning their investments with its values while catering to the wish of the next generation to invest in a sustainable fashion, and foundation boards wishing to align their investments to the foundation’s mission and also be in line with regulations. 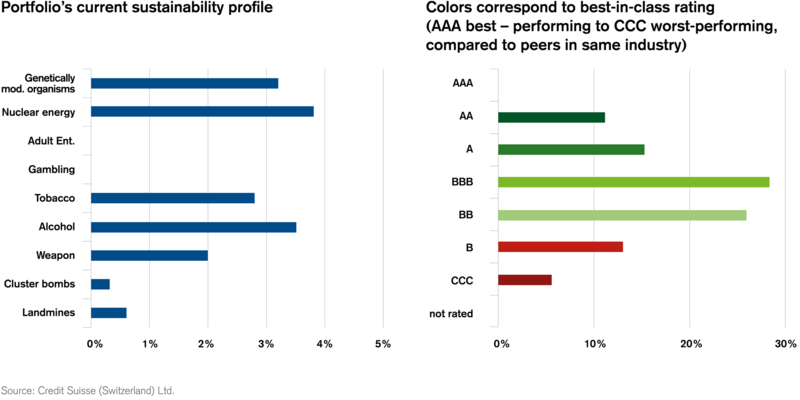 In this particular case, Credit Suisse's experts assisted the investment committee by screening its portfolio in terms of Credit Suisse's Sustainability Standard as well as their own business selection. Based on the results of the analysis, the fund reduced the number of its positions associated with businesses involved in controversial industries. It also divested from companies performing poorly on ESG and put a stronger focus on sustainable investments in their portfolio. The reduction in exposure to these controversial industries helped the pension fund mitigate associated reputational risk. It also ensured that its beneficiaries could now be sure that the money in their pension fund was meeting high ESG standards. Importantly, this rebalancing of the portfolio in light of sustainability criteria required no compromise in terms of portfolio return or volatility. The investment committee's actions were also in line with recent developments among institutional investors in general – not just pension funds – in terms of moving toward sustainable investment and considering ESG-related risks and opportunities alongside traditional valuation criteria. Learn about Credit Suisse’s offering for pension funds. Like foundations, they are also under increasing scrutiny regarding the sources of their returns, with calls for more transparency on the type of investments they make. Investment committees in many institutions increasingly turn to it as a way of helping them make better-informed overall investment decisions by considering environmental, social, and governance (ESG) criteria.